The more I thought about that room and the materials it contained, the more it left me with a sense of deep concern. 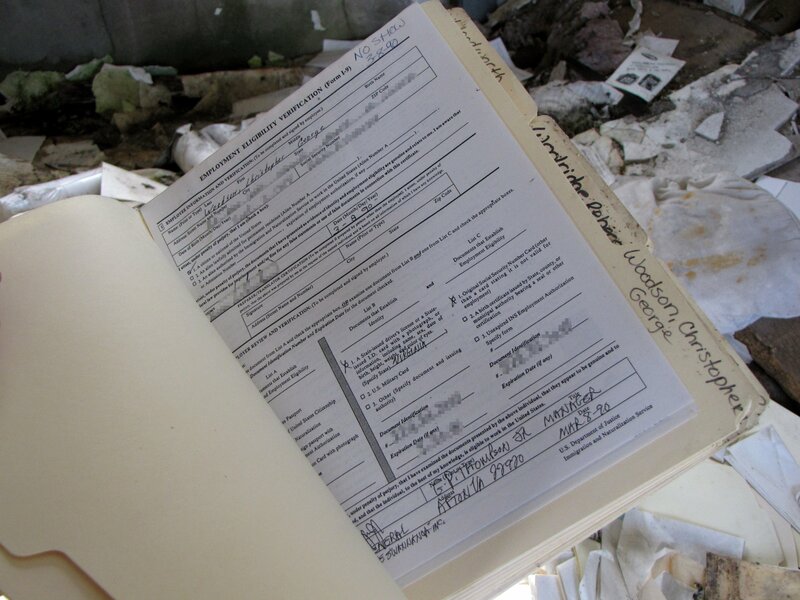 Personnel files usually contain names, addresses, dates of birth, and social security numbers, among other things. And identity theft is a big concern. 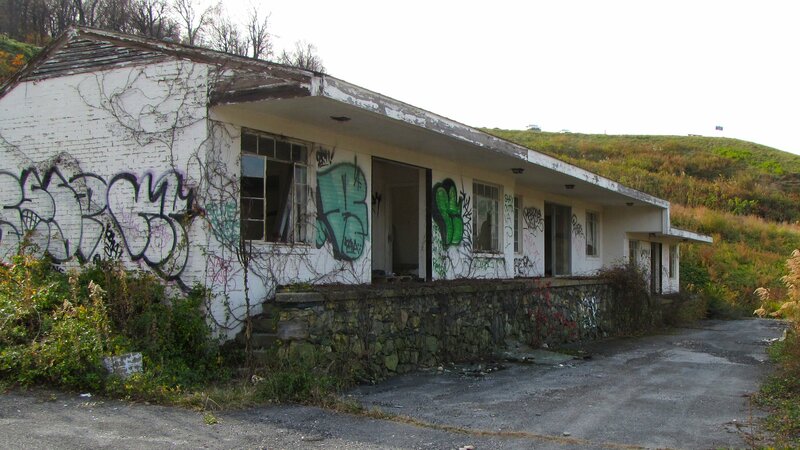 These buildings are completely wide open, and anyone can walk right up and rummage through them. And based on the graffiti found inside and out, people have definitely seized the opportunity and come through. A completed Form I-9, containing name, address, date of birth, and social security number. A completed Form W-4 for another employee, containing name, address, and social security number. 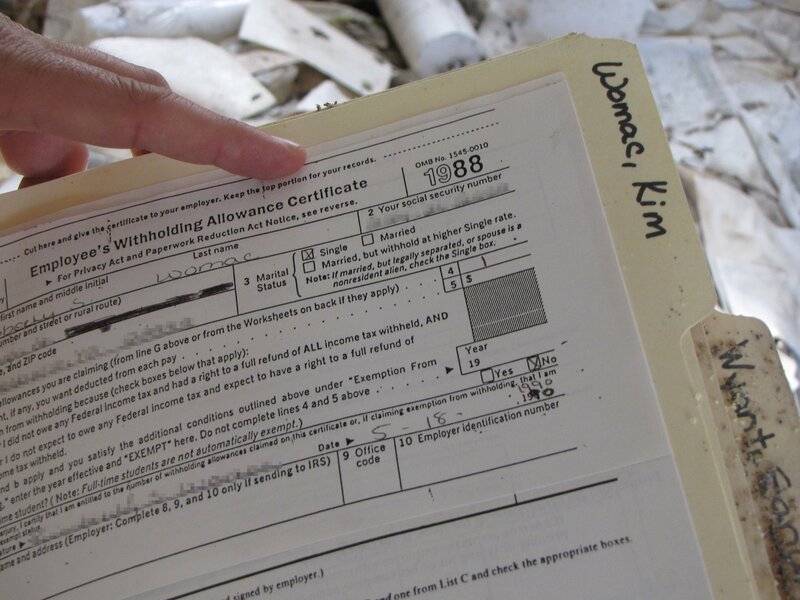 A completed I-9 was attached to this form. Employment application for the Howard Johnson’s, containing name, address, and social security number. As always, click the images to see them in large size. I have redacted addresses, dates of birth, social security numbers, and signatures. The forms that we found all dated from the early 1990s, but I don’t know when the materials were placed in this room. I discovered them in May 2012, but I suspect that they have been there much longer than that. This was just one small pile of materials that we found in this wide open room, full of all sorts of records from Dulaney’s businesses. 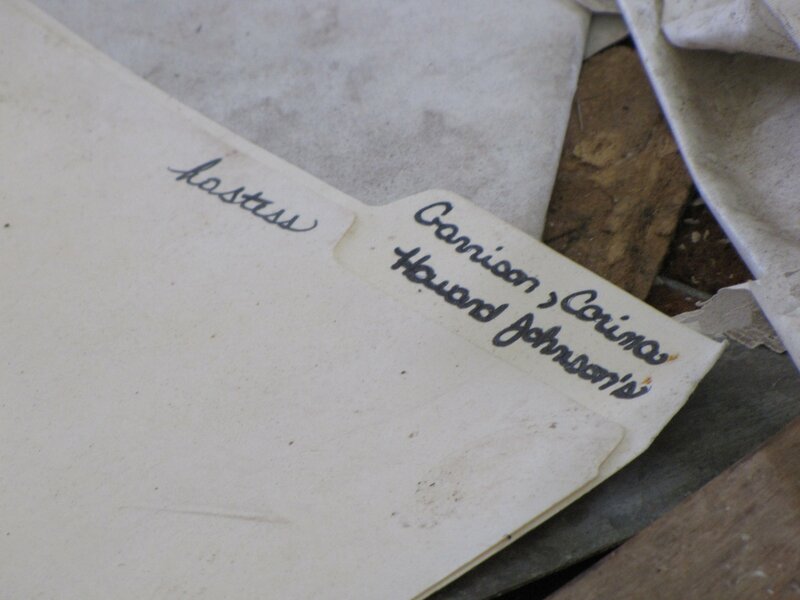 I specifically spotted business records from the Howard Johnson’s and the gas station, but there may be more. I don’t want to even try and imagine how many people’s identities have been compromised by these documents’ presence in this room. It’s scary. 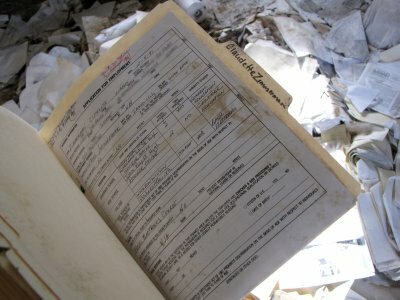 The people whose documents have been rendered illegible by the effects of water and mold should consider themselves very fortunate, because this is beyond irresponsible, if not downright reckless. This room seems like an identity thief’s dream come true, as there is probably more than enough information here to steal someone’s identity and cause them many problems down the line. Phil Dulaney should be ashamed of himself for allowing his company, Skyline Swannanoa, Inc. to be so loose with its employees’ personal information that should have been kept in a secured location or destroyed. The sad thing about this is that the people most likely to be negatively affected by this are the former employees of Skyline Swannanoa, Inc. whose only “crime” was working for a man as irresponsible as Phil Dulaney. Even if he wasn’t the one who dumped the materials here, and even if he didn’t know that this dumping even occurred, it is still his company, and therefore the buck stops with him. Thus it is ultimately his responsibility that this information has not been properly secured or destroyed. The employees had nothing to do with this sort of negligent behavior, and they stand to suffer the most for it. That said, if you have ever worked for or applied for a job with Skyline Swannanoa, Inc., you should probably sign up for credit monitoring services. That includes The Inn at Afton (formerly a Holiday Inn), the Howard Johnson’s on Afton Mountain, the Skyline Parkway Motor Court, the Skyline Parkway Motel, the Afton Mountain Convenience Store, the Swannanoa mansion, and any other business that has been owned and/or operated by Skyline Swannanoa, Inc. Your personal information, and therefore your identity, could be at risk. We found files for six people. There are almost certainly more.